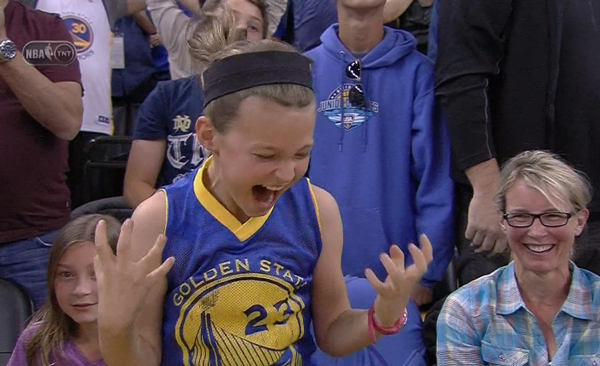 A clutch three-pointer by Warriors guard Stephen Curry caused a young fan to celebrate like crazy at Oracle Arena. Stephen Curry's MVP case just added its feel-good moment of the year. To make Curry's case for his first MVP award, you can point to his stats, advanced stats, impact stats, or to Golden State's dominant point differential, two-way brilliance and remarkable consistency. Or, you can just watch this young female fan scream and jump in absolute delight while celebrating a clutch Curry three that came late in Golden State's 107-106 home victory over Phoenix on Thursday. Curry's triple, which came with less than 10 seconds left and gave Golden State a one-point lead, wasn't the game-winner. That belonged to Harrison Barnes, who rattled home a runner to answer an Eric Bledsoe layup on the other end. It was Curry's three that generated the most memorable moment, as TNT's cameras captured the young female fan, wearing a blue Draymond Green jersey, completely losing her mind as her family members looked on with wide smiles. The signature moment capped off a scrambled play that saw Golden State hit the offensive glass and kick the ball back out to the perimeter. Klay Thompson earned the assist on the sequence by drawing the defense to him at the right elbow before swinging the ball to Curry, who was busy spotting up to his right. Phoenix's closeout on Curry was painfully late and the shot swished through, sending the Warriors bench and the home crowd into celebrations. Curry finished with a game-high 28 points, eight rebounds and five assists. Thompson added 16 points and six assists. Six Suns players finished in double figures. Bledsoe tallied a team-high 18 points and 11 assists. Golden State improved to 62-13. Phoenix fell to 38-38.